cadXtract is the perfect software to complete your production process. It closes a gap between two important steps of the work preparation. The 3D computer models of your workpieces, as well as the works (e.g. drilling, milling) that belong to them, are usually exported as a STEP file by the CAD program. However, the CNC machine receives it‘s data from the CAM software in the numerical control programming language (NC), also called the G-code format or G programming language. 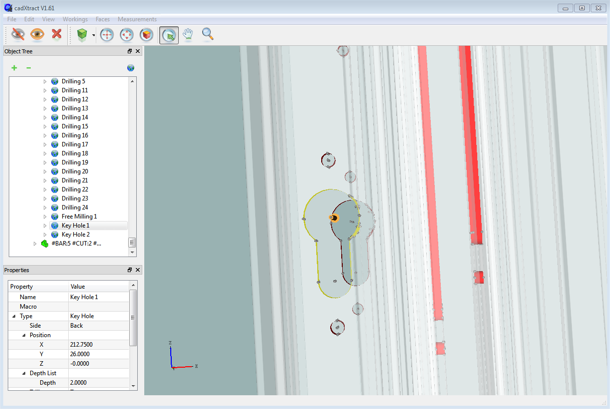 That’s why, often, the CAD data are manually programmed in the CAM software. A huge workload, as well as a potential high error rate caused by wrong dimensioning or missing works, are the result of the usual manual procedure. Tailored to the field of aluminum machining, cadXtract is the interface that enables the communication between STEP and NC files. CadXtract simplifies the data preparation and reduces your work preparation time up to 90%. Only in a few remaining cases is manual reprocessing necessary. Besides that, some operations, such as inclined nothings are so complex that manual programming is nearly impossible. This fact makes cadXtract an essential element in your production. cadXtract exports data in the NCX-Format. As far as possible, works are categorized as standard works, e.g. slot, pocket or rectangular circle, countersink, etc. 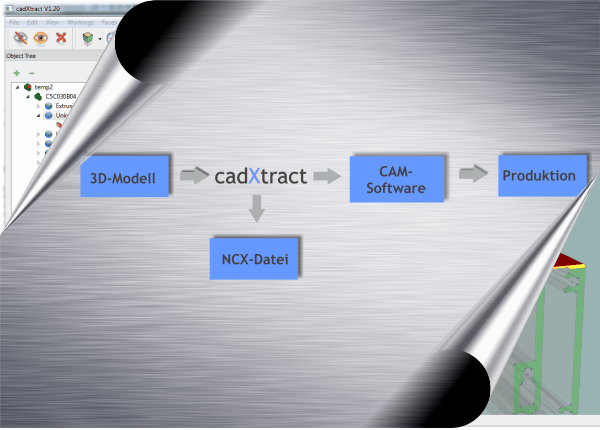 In order to be able to connect the advantages of an automatic data analysis with possible individual adjustments to the workpiece, cadXtract provides a clear and simple design preview, which allows additional control of the works detected by the program. For example, you can decide that a notching, processed on a 5-axis machine, should be made with a saw, while on a different machine the same notching is processed as a pocket working. What is the NCX format? NCX stands for Numerical Exchange, which is an exchange format in text form. A CNC machine however needs NC code in order to proceed works (e.g. drillings, millings). Therefore you need a software, that converts the NCX data into the G programming language. A CAM software, such as camQuix, has this kind of function. Take a look at our website, if you have any questions, please do not hesitate to contact us! We are always available for your needs.